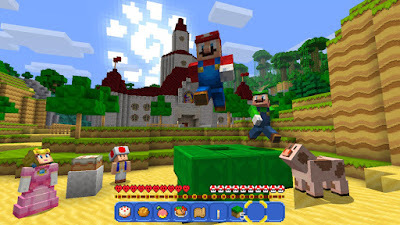 The Qwillery: Nintendo Download: Play Minecraft Anywhere! Minecraft: Nintendo Switch Edition game, available at 6 p.m. PT onMay 11 in Nintendo eShop. *Additional games, systems and accessories may be required for multiplayer mode and are sold separately. Online features will be free through fall 2017. After the free-trial period, most games will require a paid online service subscription from Nintendo in order to play online. Currently, the free-trial period, the paid service, and online play (for applicable modes in compatible games) will be available for customers in the U.S., Canada, and Mexico. For the latest list of countries, please visit Customer Support.